The Mankato Marathon is the Midwest’s boldest race, showcasing a dynamic course and determined runners.The Mankato Marathon is an award-winning race, receiving recognition as the “Top Marathon Worth Traveling For in Minnesota” from FlipKey by TripAdvisor and a Top 20 Half Marathon in the country by The BibRave 100.This exceptional course features a vast countryside run at the beginning and culminates in the beautiful, yet challenging Minnesota River Valley with Cheer Zones to help you stay motivated. There’s a race for every runner—a full marathon, relay, half, 10K, 5K, KidsK, Toddler Trot, and Diaper Dash. A host of accompanying weekend activities abounds for the whole family. 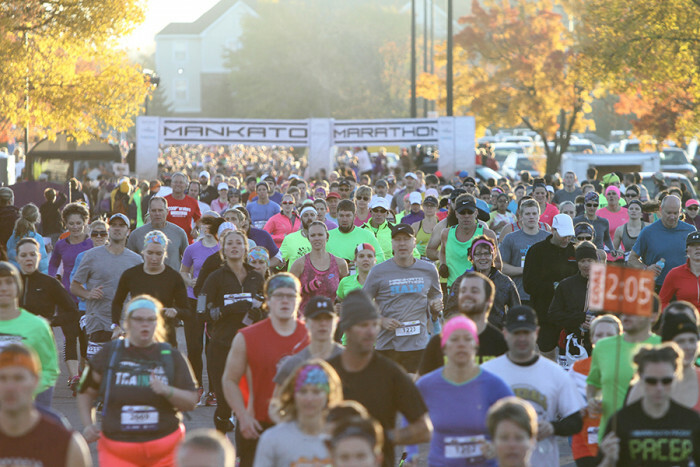 The Mankato Marathon is a certified course, making it a Boston Marathon qualifier. Be bold. Event fees are non-refundable and cannot be transfered to next year's race.